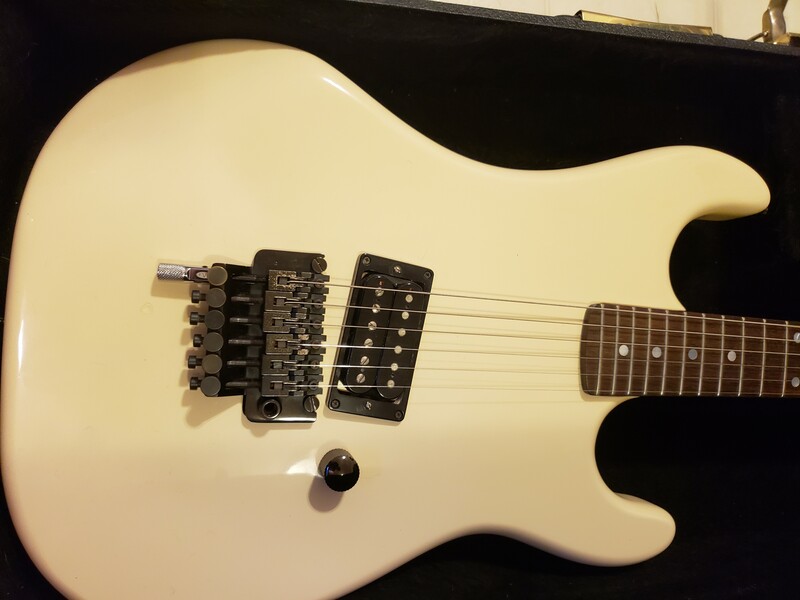 NGD Help I.D. Strange Baretta. 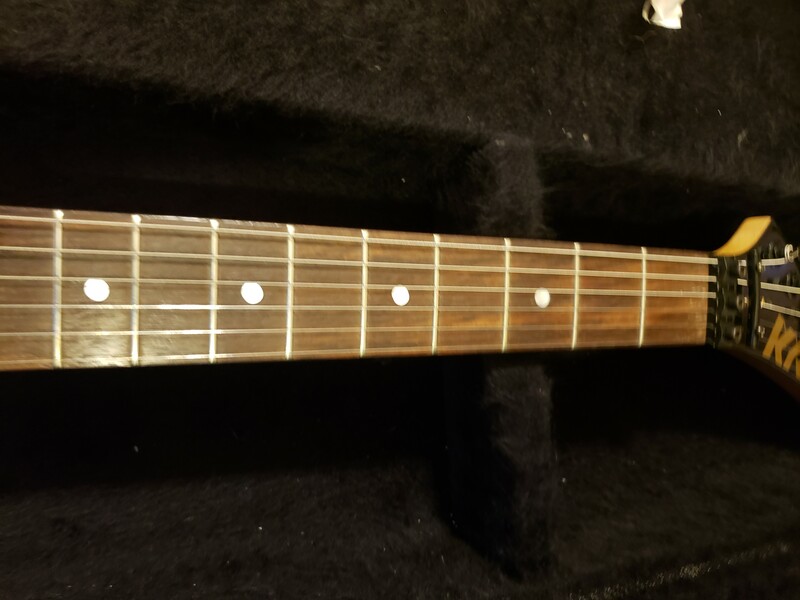 I started a new thread to help with identifying this strange guitar. I am pretty sure it is a factory warranty replaced neck. Any knowledge or thoughts you folks have is greatly appreciated. The body looks exactly like an 85 body. Neck has to be mid 86 or later. The pickup route looks 85 and has RS or R5 written in black marker in the pocket. There is no markings on the neck or in the neck pocket. The neck pocket has NO factory shims. The neck angle is correct. The plate looks original to the body. It is a black D plate. 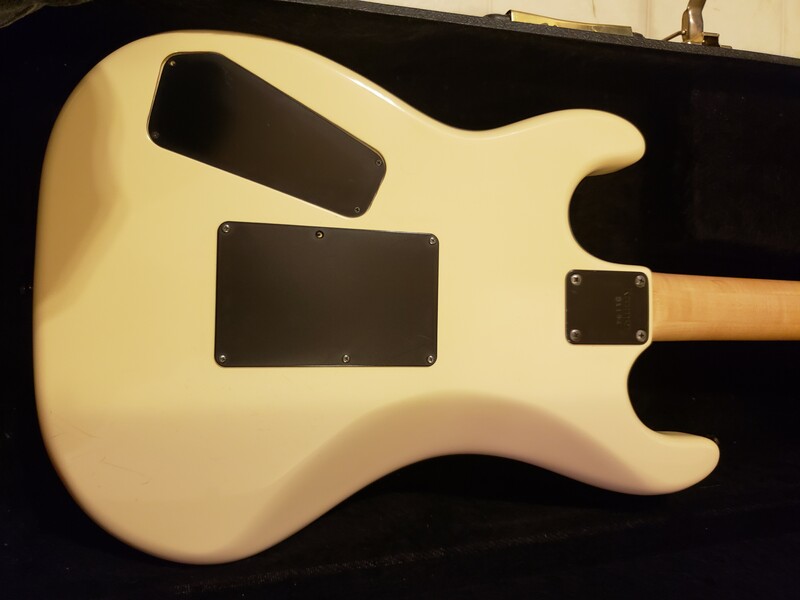 The neck has only 4 holes and the neck screw holes are tight. The nut is an R2. The neck angle is correct. The pot has been changed. The pickup is an old JB JBL, all black. The pickup ring does not look original. Not the usual Schaller ring. The Floyd is an original 85 small logo. 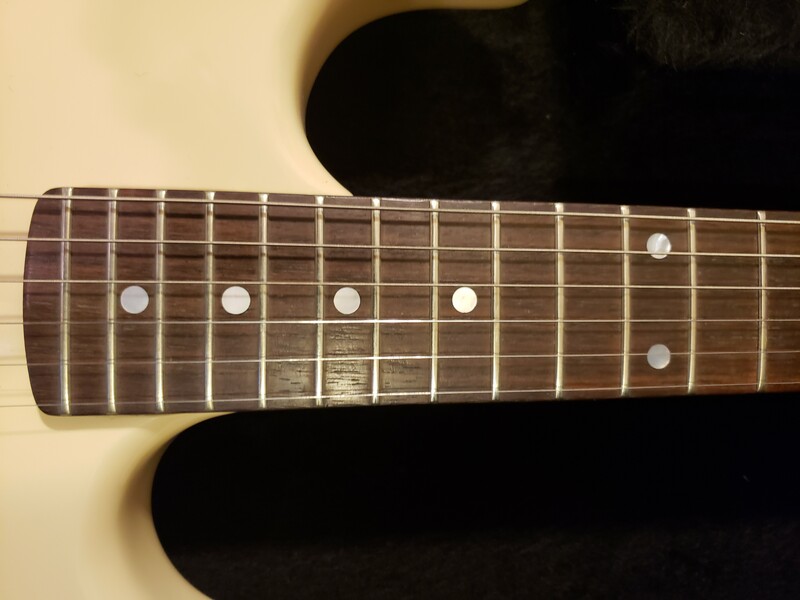 The dots on the fret board look pearl. (Not sure when they started that). The case seems odd to me. 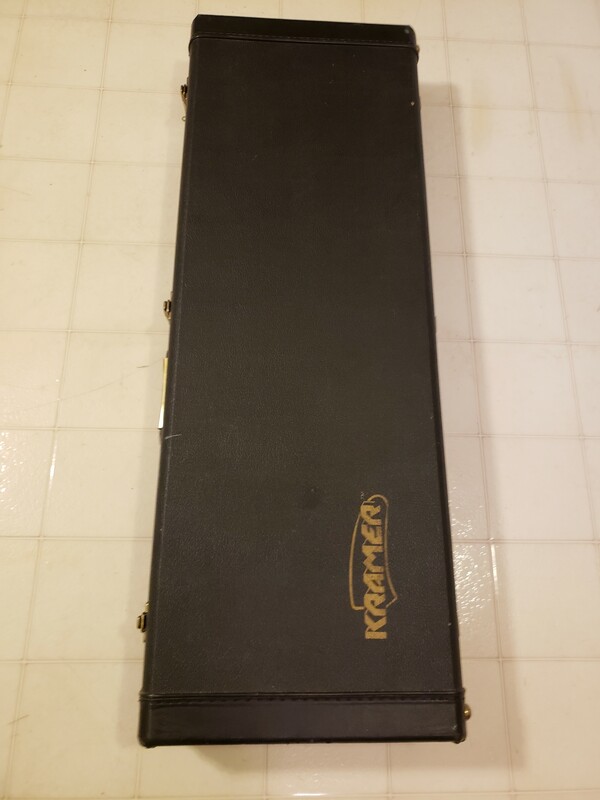 I have never seen this brand or style Kramer case. It does have an old patina to it. I am leaning to thinking this was a warranty neck replacement. I'd have to agree its prb a warranty replacement neck. You'll have to look at the trem cavity; that would give you clues as to the origins of the body. If there's a secondary route or half-ramp for the springs, it's likely a Sports body. If it's fully ramped across, it's an ESP body. Also if there are no shims it's likely an ESP body. Judging by the contours alone, first guess I think early ESP body, originally with scarf-joint nana head neck, warranty re-neck. Second guess? Neck plate swap. I've seen it happen; heck I've done it before. Lucky neck plate thing. Thieves employ such tactics. Third guess? The neck could have been swapped at the store. I've seen this done too, personally, at that time. Guy at the store wants to make a sale. You love that gutar's sound but not feeling the neck. Then there's the other guitar with the killer neck but fuscia paint. Chocolate, meet peanut butter. This is a lot easier with ESP era parts, because the Sports era stuff was so inconsistent with neck plate placement. Then again, I got a recent 1984 neck, and bolted it onto an 82 Pacer body I got from Menace, and the screw holes lined up perfectly. It is half ramp. It looks like a Sports body. Most likely a warranty replacement or NOS neck. Most used necks would be drilled for a narrower cast plate. Everest, TKL and Boblen are all the same, from Montreal. 80sChris wrote: Most likely a warranty replacement or NOS neck. Most used necks would be drilled for a narrower cast plate. That was also my thought on the neck. Because the neck plates holes are NOT spaced the same as the cast plates. So you would see wider body holes and 8 holes in the neck if it was a swapped neck. Only a new neck would have 4 holes. The holes are also super tight. This neck has not been off this guitar very often. It is a clean neck. It is a clean guitar. A few nick's and dings. Nothing that bothers me. 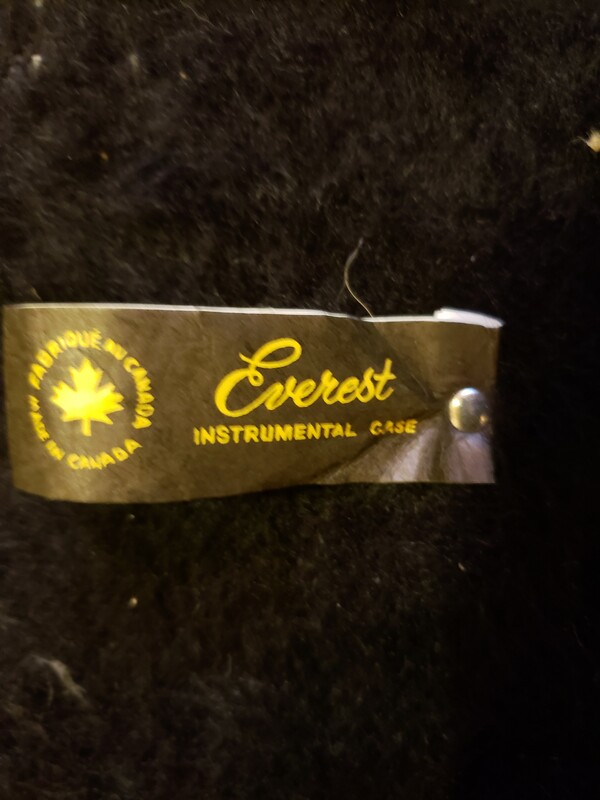 I have one of those Everest cases too. 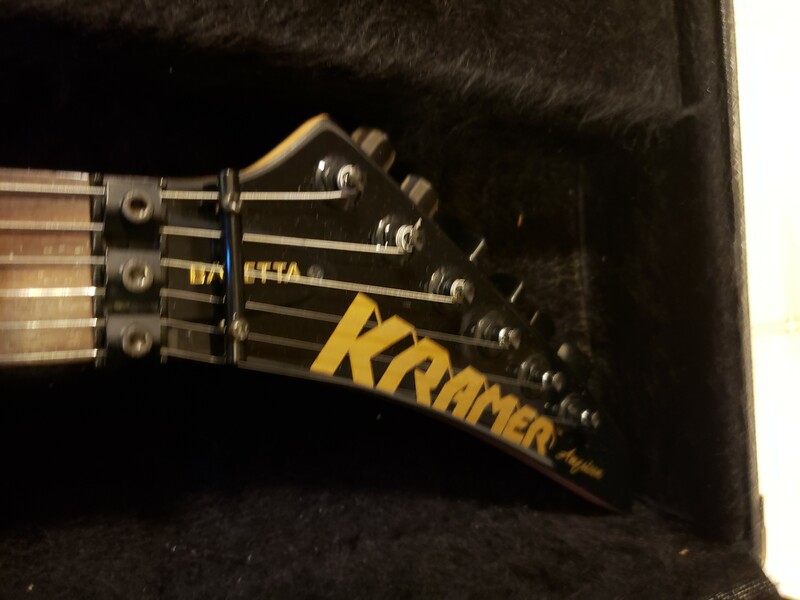 They are the only Kramer cases that you can leave the whammy bar on and close it with clearance. 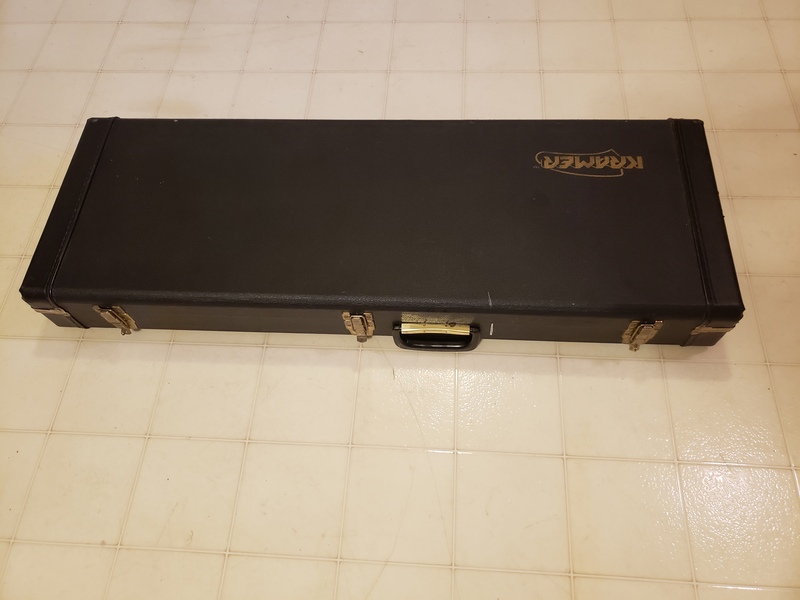 The down side is that the case has too much room and the guitar can move around. Pointy guitars need to be immobilized, so I only use that case for storage. Would never use it for gigging. I've never seen a pyramid replacement neck for warranty, but that doesn't mean that it isn't. Most were block logo era to late '86. I can't tell from the photos. You'll have to send it to me for an indepth, extended analysis. ^Dang, beat me to it. Set up on floyd looks curious to me. I agree with above on the logo, are these your pics? 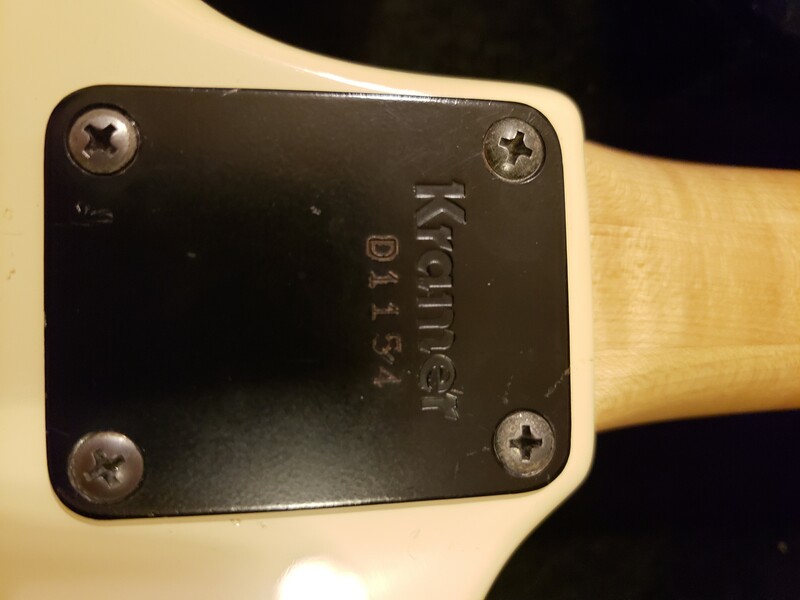 Need better angles, but I am not the be all end of Kramer identification.